stamped! the best sunday night spot. yep yep!! 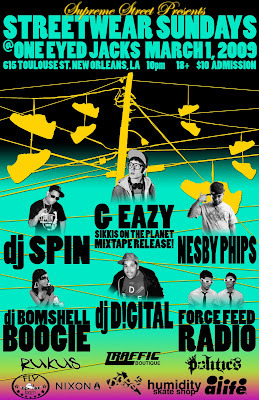 this edition of street wear sundays will feature cool rapper g-eazy and nesby phipps. i don't know about y'all, but im TOO excited about this one. not only is the event cool as hell, it's the only event in this city that's on some different ish, and you can quote me on that. the music is so fresh. even if you're not into the whole street wear scene, if you're into REAL hip-hop, you'd be bout it. if you have yet to attend sws, now is the time. i love that song! if you're wondering, the featured song is called "kicks different colors" by que billah feat. the cool kids, off the crack tracks "space musik" mixtape. hot ish. ff was a blast. i got tipsy a lil too early, but still had a fab time. 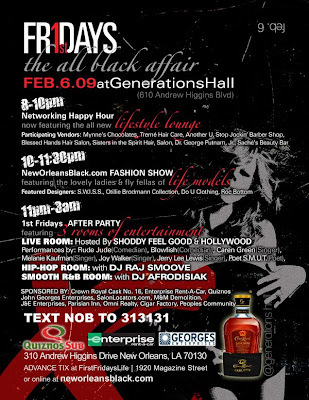 check out the pics on www.neworleansblack.com. my fave. i ♥ him. shouts out to saché for painting my eyes. u should def check out saché's beauty bar in terrytown. team neworleansblack. we all we got. 1st fridays: all black affair. we had a lil superbowl shindig at mark's house, which turned into a party. super fun! go steelers! im not even into football, but if he likes em, i love em. ha! a mini heini. how cute is that? !